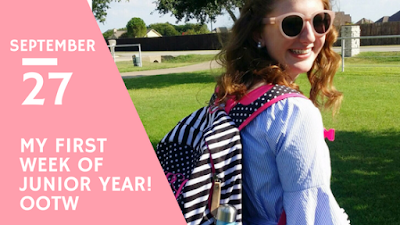 My first week of school was about a month ago and I never go around to sharing about it but I did a recap last year and wanted to at least share my outfits this year so here is an OOTW for my first week of junior year! Since my first week was so long ago I don't remember all of the details of each day so those won't be featured in this post like they were last year but if you would like to read my recap from last year click here. Monday was my first day and I wore this pretty blue and white striped dress that I found at Dress Barn on sale! The sleeves, neckline, and hem had a fun ruffled layer and it also came with a ribbon to tie into a bow; don't worry, the bow didn't look that bad all day, this picture was taken after school. Tuesday: My top is a pink and navy striped boat neck tee from Old Navy, I wore dark wash Old Navy skinny jeans, and Tommy Hilfiger loafers I got on sale for $20 at Marshalls! Wednesday: Wednesday was our church kick off so we all wore our church shirts to school. So nothing exciting that day. Along with the tee shirt I wore Old Navy jeans and my Birkenstocks. Thursday I wore the amazing Old Navy white and navy polka dot dress with my Jack Rogers. Friday I was tired so I went with a Jadelynn Brooke logo tee I got in my rep package, Old Navy jeans, and Jack Rogers. You can use my code SLMHS to get all Jadelynn Brooke products for 15% off at JadelynnBrooke.com.